TEL AVIV - Israel is making a new effort to engage the people of Iran, as the two regional rivals trade increasingly tough rhetoric and threaten to attack the other in self-defense. Under that Israeli initiative, the nation's government-funded broadcaster re-launched Farsi-language radio programming for Iran in January after an eight-month hiatus. 43-year-old Netanel Toobian, a native of the Iranian city of Isfahan, is the radio show’s new Israeli director and also serves as a host. Netanel Toobian, director of Persian broadcasts at Kan, speaks to VOA Persian in Tel Aviv, Israel, Jan. 18, 2018. He migrated to Israel with his family 30 years ago, escaping rising anti-Semitism in post-Islamic Revolution Iran. Three decades later, tensions between Iran and Israel have been increasing. Iranian Supreme Leader Ayatollah Ali Khamenei’s website posted a video of him speaking to Syrian visitors on March 1 about his 2015 prediction that Israel, or the Zionist regime as he calls it, will disappear in 25 years. “I said that you [Israel] will not see the next 25 years. By Allah’s favor, that day will come,” Khamenei said. Five days later, Israeli Prime Minister Benjamin Netanyahu told American pro-Israel group AIPAC in Washington that he is determined to stop Iran from becoming nuclear-armed, despite Tehran’s denials that it seeks such a capability. The Israeli prime minister also struck a conciliatory tone toward the Iranian people, sympathizing with what he called their suffering, hopes and courage in advocating for freedom from Islamist rule. “We stand with those in Iran who stand for freedom,” he said. Israel’s renewed Farsi radio programming is another element of its public outreach toward Iranians. Overseeing that programming is the Israeli Public Broadcasting Corporation, also known as Kan. It began operating last May as part of a government reform of state-funded broadcasting. Israel had been producing Farsi-language radio shows for decades, but they went off the air when the former Israel Broadcasting Authority closed, just before Kan’s debut. The previous Farsi program director, Iranian-born journalist and commentator Menashe Amir, had served as a Voice of Israel Persian broadcaster for 57 years. In January, he began directing and hosting his own Farsi news show from his home in the Israeli West Bank settlement of Har Adar. In a recent interview with VOA Persian at Kan’s new Tel Aviv studios, Toobian said he has tried to learn from Amir’s experiences, while also experimenting with a fresh approach to Farsi programming. Since January, Kan has been broadcasting that content to Iranians live via satellite and through a live stream on its Farsi web page. It also has been offering on-demand access to the Farsi shows through an online archive. 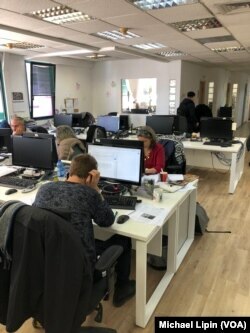 Tel Aviv newsroom of Kan - the Israeli Public Broadcasting Corporation, January 18, 2018. Iran’s government traditionally has tried to prevent its people from accessing foreign news programming that it deems hostile toward its Islamist system. Toobian said he and his team of three freelancers plan to interact more with Iranians by eventually taking calls from listeners and launching a new Facebook page to complement the team's Twitter profile. The Israeli broadcaster said his goal is to send Iran a message that it has little reason to be Israel’s rival, as the two nations do not share a border or compete for the same natural resources. In the decades prior to its 1979 Islamic Revolution, Tehran had a cooperative relationship with Israel, selling oil to the Jewish state in return for Israeli assistance in developing Iran’s agriculture and armed forces. “Our main purpose, for me personally and for the whole Persian section of Kan, is to build a bridge and to renew this historic friendship,” Toobian said.